The original drawings were done by artists from the Kuru Art Project and then the Keiskamma Art Project embroidered and appliqued the imagery from those drawings onto the cushion. This soft canvas cushion cover was handcrafted by the Keiskamma Art Project. The imagery was created in collaboration with the Kuru Art Project of D’Kar, Botswana. The Kuru Art Project features the work of indigenous San people. 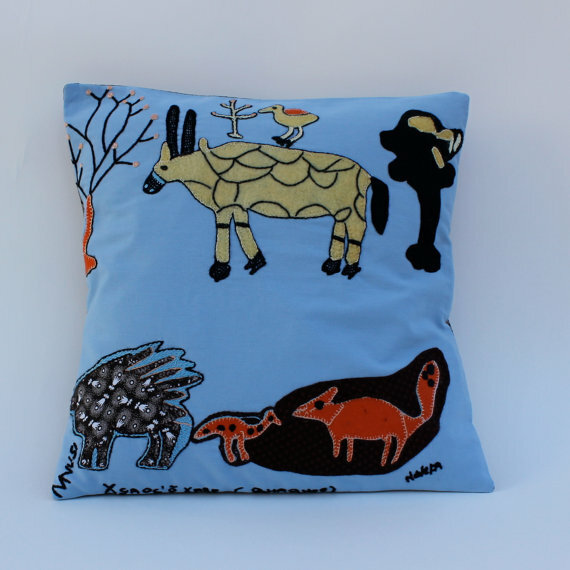 The original drawings were done by artists from the Kuru Art Project and then the Keiskamma Art Project embroidered and appliqued the imagery from those drawings onto the cushion.